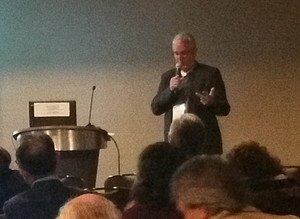 A joint congress of the AEG - Association of Environmental & Engineering Geologists - and IAEG - International Association of Environmental & Engineering Geologists - took place in San Francisco from 15 to 23 September 2018. Approximately 350 lectures were given from various engineering and environmental geological fields, mostly by American but also by a considerable number of international geoscientists. In addition to symposia on dam construction, hydrogeology & groundwater, earthquakes & land movement, environmental pollution, geological modelling and other topics, there was also a symposium on 'Naturally Occurring Asbestos, NOA'.statt. This was held in the form of a key note lecture by Prof. Dr. Alessandro F. Gualtieri (University of Modena, Italy) with a general overview on the subject of mineral fibres, a panel discussion, 34 individual lectures on the subject of naturally occurring asbestos and an excursion to a recently completed dam project (Calaveras Dam Replacement Project) in the midst of asbestos-containing rocks. At the invitation of Mark Bailey (Asbestos TEM Laboratories Inc., Berkeley, CA, USA), Chairman of the NOA Symposium, our colleague Dr. Stefan Pierdzig participated as a speaker with a lecture (Regulations concerning Naturally Occuring Asbestos (NOA) in Germany - Testing Procedures for Asbestos) and as a participant of the panel discussion. Prof. Gualtieri presents the state of multidisciplinary research in the field of asbestos and mineral fibres. He points to the harmful biochemical interactions of mineral fibres with the human body, which have so far been poorly understood. He calls for a closer collaboration between the mineralogist / crystallographer who looks at the asbestos fibre and the biochemist / toxicologist / doctor on the other hand who takes the perspective of the organism interacting with the fibre. He also points out that there are a number of other mineral fibres that have not yet been regulated, from which there are reasonable suspicions of their carcinogenic activity in the human body. What is asbestos (mineralogical, morphological)? The water reservoir of the Calaveras Dam has served the water supply of San Francisco for more than 100 years. After the old dam (top right in the picture) became unstable due to tectonic earth movements, a new dam was built in the last 7 years (middle in the picture above). Several million tons of rock were moved for this purpose, partly metamorphic rocks with a high asbestos content. In this project the glaucophane, a high pressure metamorphic amphibian, was classified as an asbestos mineral due to its fibre morphology. During the excursion and several related lectures, the individual phases of the dam construction as well as the extensive protective measures for workers and the population (including numerous stations for continuous air measurement around the construction project) were explained. In some countries (USA, France, Italy, Australia) there are small-scale maps in which potentially asbestos-containing rocks can be mapped, subdivided into up to 4 risk classes. This is an important instrument for the risk assessment of infrastructural measures such as road, railway, tunnel and waterway construction and, to my knowledge, does not exist in Germany. Cross-border adaptation of asbestos and fibre definitions? Germany seems to be the only country (TRGS 517, ... It is irrelevant whether an asbestos fibre was released from a fibrous or non-fibrous occurrence of an asbestos mineral) in which fission products of possibly non-fibrous asbestos minerals are also used for a risk assessment, which only arise when the material is subjected to mechanical stress. Possibly for good reason ... (see next point). Other countries only consider primarily fibrous asbestos, which is distinguished from fission fragments by its morphology, including the aspect-ratio (length-diameter ratio). Vigliaturo Ruggero, University of Pennsylvania, will present the results of a study that shows that fission fragments of amphibol asbestos (anthophyllite, grunerite, amosite) are absorbed by cells in the presence of long fibrous asbestos, biochemically surround themselves with an iron (oxide) layer and encapsulate and trigger lung and mesothelial diseases. Other fibres from different mineral groups carcinogenic? Different research groups point to the (potential or proven) carcinogenic effect of mineral fibres. For example, some countries have only recently started dealing with the asbestos problem of road surfaces or other products made of potentially asbestos-containing rocks (France since 2013) and some have no national guidelines for quantifying asbestos in such products. In other countries, the asbestos problem has been intensively addressed in major projects such as the Calaveras Dam Replacemment Project in California, the construction of a largely underground bypass around Genoa or the construction of a railway line in South Korea. In any case, the methods for quantifying asbestos are inconsistent and lead to different results (see also the following point). ... in natural or technical materials at present only the Health and Safety Laboratories, HSL, Great Britain seem to offer with their LACS program - low asbestos content scheme - (results of some discussions). As far as can be ascertained, there are, if any, only ring trial projects for technical products with qualitative results. The informative value of the LACS series suffered in the first four rounds from the fact that the results of different analysis methods TEM, REM, PLM and investigation guidelines such as ISO 22262-2 and BIA/IFA 7487 were lumped together and not considered separately. It remains to be hoped that this will change with the current Round 5.